I love this chicken dish, as it is a complete meal on a plate and perfect for those warm summer days when you do not want to spend a lot of time in a hot kitchen. It is really also so colorful (and delicious) that it is great for summer entertaining as well. Just be careful not to overcook the chicken, because sliced this thin the chickens cooks up quickly. I always buy my chicken breasts whole, and debone and slice them myself, but to simplify things you could buy your chicken already sliced if you prefer. A light summer entree that is low in fat but high in flavor. If slicing the chicken yourself, place the chicken breasts in the freezer for one hour before slicing. Slice the breasts lengthwise 1/3 of an inch thick, removing all fat, and place the chicken slices in a bowl and add the olive oil, salt, pepper, lemon juice and zest. Toss to coat the chicken evenly, and then let the chicken rest 1 hour before cooking in the refrigerator. While the chicken is marinating, toss together the rest of the ingredients together for the tomato salad. To cook the chicken, lightly spray a non-stick frying pan with oil and fry the chicken pieces for about two minutes on each side over medium high heat until lightly browned and cooked through. Continue to cook all the chicken slices in the same manner. Arrange the chicken on four individual plates with the arugula on top. 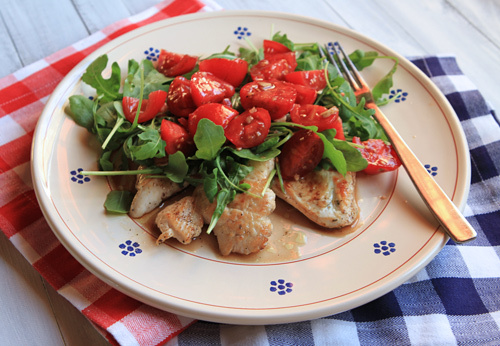 Spoon the tomato salad on top of the arugula and chicken, dividing it equally amongst the four plates, and drizzle any of the dressing over the tomatoes, and serve immediately.